El Dr Lucas Leys es quien entrena la mayor cantidad de lideres juveniles en Hispano America. Es el Presidente de Especialidades Juveniles, el ministerio especializado en pastoral juvenil de mayor crecimiento en el mundo de habla hispana y el Publisher de Editorial Vida. Fue pastor de jovenes por varios anos en distintos paises y hoy viaja por el mundo hablandole a miles de jovenes y lideres en conferencias, convenciones, universidades, escuelas, iglesias y seminarios. Lucas ha participado en numerosas publicaciones, programas televisivos y radiales cuando el tema es la adolescencia. Es autor de mas de 15 libros. Algunos de ellos son ' El Ministerio Juvenil Efectivo', 'Generacion De Adoradores' "Viene David", "Adolescentes, como trabajar con ellos", y '500 Ideas para el ministerio juvenil' entre otros. Tambien ha sido el editor general de la Biblia G3 y el productor de algunos CDs.Lucas Leys es Doctor en Teologia, graduado con honores en el Fuller Theological Seminary, esta casado con una super chica llamada Valeria, es papa de los hermosos Sophie y Max y le cuesta mucho quedarse quieto... Lucas Leys has worked in youth ministries for churches in several countries and denominations and has participated in a variety of Christian ministries. He earned a doctoral degree with honors from Fuller Theological Seminary. He is the director of Youth Specialties and produces resources for youth ministers. He is one of the founders of LAGRAM, an organization that works with local churches on evangelism and discipleship for teenagers. This young man has already written more than 10 books, including Effective Youth Ministry, which was nominated for the 2003 Gold Medallion Award as the best book originally written in Spanish. - Publisher The metaphors of Jesus have been used to move the masses as well as individual hearts and minds, armies and political alliances, and without a doubt these have made him the most influential person that this planet has ever seen throughout history. For that reason, regardless of any religious convictions that the individual reader may have about him, it remains almost impossible to argue against the idea that He is the most transcendent personage in the history of this earthly orb and that He is a worthy example of leadership for this new millennium, as this young Hispanic writer proposes. What was it that made Jesus so influential? How did a Jewish carpenter have such a sustained impact on the world? What habits can we learn from him to reach our highest potential in our private lives at the same time that we are trying to influence the global village? Jesus has been the best leader of history and today there continues to be no better role model for leaders of the next generation. 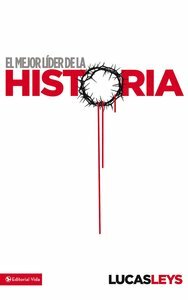 About "El Mejor Lider De La Historia (Best Leader In History)"
The metaphors of Jesus have been used to move the masses as well as individual hearts and minds, armies and political alliances, and without a doubt these have made him the most influential person that this planet has ever seen throughout history. For that reason, regardless of any religious convictions that the individual reader may have about him, it remains almost impossible to argue against the idea that He is the most transcendent personage in the history of this earthly orb and that He is a worthy example of leadership for this new millennium, as this young Hispanic writer proposes. What was it that made Jesus so influential? How did a Jewish carpenter have such a sustained impact on the world? What habits can we learn from him to reach our highest potential in our private lives at the same time that we are trying to influence the global village? Jesus has been the best leader of history and today there continues to be no better role model for leaders of the next generation.